HRD attestation is mandatory for completing the embassy attestation process. HRD attestation is for verifying the authenticity of the educational documents submitted by you while applying for higher studies or job in abroad. The attestation is done by the concerned state HRDs of each states. You have to submit your educational documents for verification to the state where you completed your education. HRD attestation is done only for government approved (UGC/AICTE/NCERT) educational documents. 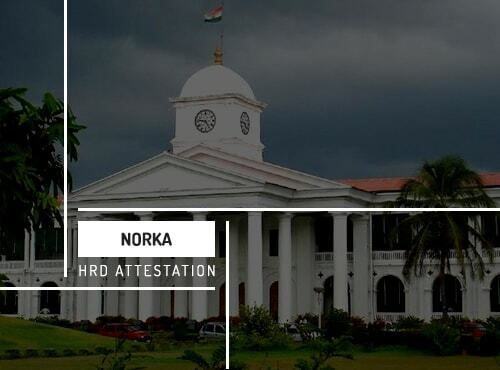 Norka Roots is the government authorized agent in kerala for doing HRD attestation. Norka roots do the attestation and verification process for educational certificates issued by the state of Kerala. Anyone who completed their education from government recognized universities and schools in Kerala has to attest their educational documents from Norka roots. Norka attestation is mainly done for verifying the authenticity of the educational documents to use abroad. People who completed their studies from Kerala has to get Kerala HRD attestation for getting admissions in foreign schools and universities. It is mandatory for keralites who travel abroad for employment opportunities in Gulf and other countries. It is compulsory in certain countries to provide HRD attestation for verification purposes. For example, in countries like UAE, you need to submit the attested degree certificates before joining for a job. Urogulf Global Services is an ISO certified attestation company approved by Ministries and embassies in India and abroad. Established in 2004, we are the largest attestation company in the world with more than one hundred offices across India and abroad. We provide certificate attestation, authentication and verification services all over India and abroad. Urogulf is an government authorized certificate attestation service provider. Norka attestation process is tiring and time-consuming process. Urogulf helps you to get your HRD attestation quick and hassle-free. We have experts who can guide and assist you throughout the attestation process. Our excellent customer care service can help you with the necessary information regarding the norka attestation process. We have offices all over Kerala.Contact your nearby Urogulf office in Kerala to know more about HRD attestation process. I got my degree certificate attested before the date they said... very satisfied with this company.... Going to attest my marriage certificate also.. Excellent service. Good guidance.let almighty to make your service more graceful in future.